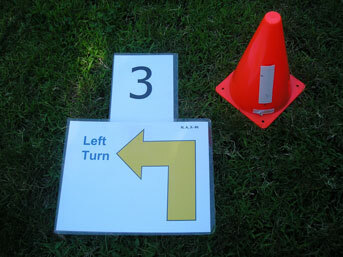 9" cones with holes for stakes – Donuts can be used also – Industrial velcro used for attaching numbers to signs and signs to cones. The cones and velcro can be purchased at a Home Supply store. Contact me if you need more information. Using industrial velcro on my signs/numbers/cones has lasted for over 5 years. I have used my current set on a weekly classes, currently with 5 classes a week. They are still as good as new because of the 5 mil laminate I use to laminate my signs and numbers. In case of heavy winds, these cones have 4 holes on the bottoms. I have used this set in heavy winds by staking the cone to the ground with inexpensive tent stakes I purchased at an Army Surplus store. That, along with the Industrial Velcro works well in windy weather. My signs will also sit in the Wire Holders. My laminated numbers can be velcroed to the backs of my laminated signs. 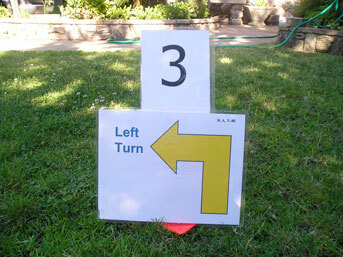 Having numbers above signs are helpful to exhibibors when running the courses. If you are using 9" cones, golf tees can be used to attach the cones through holes in the corners to the ground or with sand filled donuts. 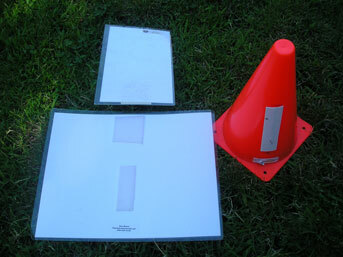 I purchased these cones from www.soccerone.com. I made the donuts. 12" heavy cones – If you are using 12" cones, they are heavy enough for an outdoor setup. This is the preferred method for outdoor setup. I velcro the number to the sign with industrial velcro that is 2" square. 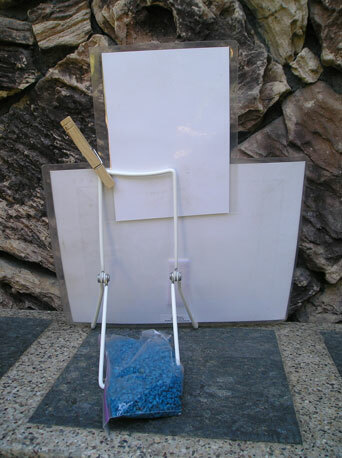 I attach the number to the sign with a small wire clip that can be purchased in hardware store. With a heavy wind, you need to rubber band the number to the cone. This works out well for my outdoor classes on a very windy day. You will only need the rubberbands if it's windy. 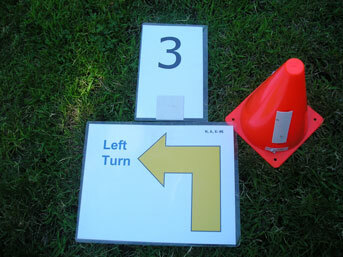 Clip Sign to large cone. Slide number in top of clip. 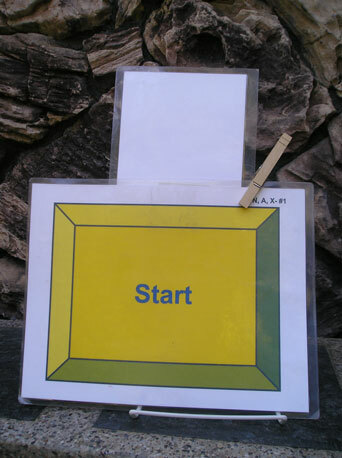 Small Vinyl coated Wire easels are great for indoor courses. These can be purchased from different on-line vendors. Price is from $2 each up. For outdoor use, use clothespins for holding signs on easel, and also use 8 oz. of sand in a baggie for holding down easel in the back. Stakes can also be used. Small stakes can be found at any local Army Surplus store. These signs have numbers velcroed to them - as above. Black pvc sewer pipe – 5" diameter, 3 3/4" high. Saw a 2-3" slit into top edge (both sides) of the pipe and slide sign into slit. These sewer pipes can be purchased at Home Depot or similar stores. They are heavy and are great for indoor or outdoor.